We have seen lots of 酒 (=sake), booze, & 飲む (=nomu), drinking, expressions in previous lesson. Did you have enough drink? = Chotto yotta mitai desu. = Sake ni sugu ni you. = Sake ni yoi yasui. *車に酔う ( = kuruma ni you) to get car sick. = Watashi no kodomo wa kuruma ni yoiyasui. = My kid get car sick easily. = I’ve gotten car sick. = to get car sick easily. = (sonoba no) kuuki ni you. = Chotto yotta or yopparatta mitai desu. = I think I got a bit drunk. = I got completely trashed. = Kyou wa nomisugite yopparaimashita. = I drank too much and got drunk today. = Shuuden niwa yopparai ga ippai iru. = There are lots of drunk people on the last train. In Japan, going out for a drink with your coworkers or business acquaintances after work is very common. Drinking helps them get rid of their inhibitions and maintain good relationships with people at work. It also helps you relax after a stressful day. But at the same time, many feel obliged to go out with work related people because they feel that it is an extension of their work . Some of you might have certain rigid image for Japanese businessman, サラリーマン( = sararii man), a salary man. It is embarassing but I can guaranttee that you would frequently see many drunk businessman in a nice suits sleeping on the train or throwing up on the train or platform. =Kare wa deisui joutai datta. = He was really trashed. = guden guden ni yopparau. = Anohito wa aruchuu (or arukooru chuudoku da. = He (She) is alcoholic. = to become an alcoholic. = Sakuya wa yoitsuburete kioku ga nai. = I passed out drunk last night and don’t remember anything. = futuka yoi ni kakaru. = futuka yoi de jugyou wo saboru. •泣き上戸 ( = nakijougo) a crying drunk, a person who cries when they get drunk. 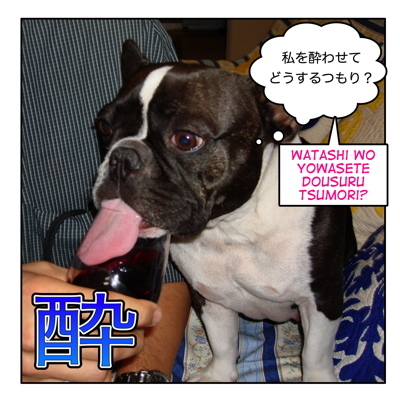 •笑い上戸 ( = waraijougo) a laughing drunk, a person who laughs when they get drunk. •下戸 ( = geko) a person who can’t hold their alcohol at all. = Korekara kurisumasu ya bounenkai, shinnenkai de ippai nomu kikai ga aruto omoimasu ga kureguremo nomisugi ni chuui shite kudasaine. = Bounenkai, Year End Party and Shinenkai, New Year’s Party season is coming up soon. You will have lots of opportunities to drink. So please be careful not to drink too much, OK? you know one thing that’s good about drunk salarymen (and drunk people in general in japan maybe) is that they usually take a train ride home! Here people would get into their car (cause almost everybody has a car) and get into a car accident! they would be like a killer on the loose here !! that’s why our drinking age in the States is so freakin high (you need to be 21 to drink!) Our driving age is 16 (you can actually get a “limited” permit when you are 14) so I guess the thinking is: if they already have a 5 year long driving experience (from 16-21) then they should know by then that drinking&driving is bad so they should be smart enough to not do it. But there are idiots everywhere….